Tell someone you’re updating your kitchen, and you’ll likely be met with shocked stares. Many people are intimidated by the idea of a kitchen renovation. It tends to conjure up images of endless construction, constant mess, and weeks or months of take-out dinners. But making a change in your kitchen doesn’t have to be a long, drawn-out process. In fact, you might be surprised at how much of a difference some small, easy changes can make. 1.Install a Backsplash: One of the easiest changes you can make in your kitchen can also make the biggest difference. Installing a backsplash not only creates a great focal point; it lets you express your unique style and personality as well. Whether you choose subway tile for a clean, modern look, or a colorful mosaic of tile, a custom backsplash can change the entire feel of your kitchen. 2.Remove Your Cabinet Doors: Removing your cabinet doors to create open shelving is an excellent way to lighten a heavy-feeling kitchen. In a smaller space, remove only one or two cabinet doors, and use the space to showcase eclectic, attractive, and colorful pieces that you love. Dishes, attractive glassware, and even dry goods stored in attractive glass jars all make excellent displays for open cabinets. 3.Replace Your Countertops: This change is easier and less expensive than you think. 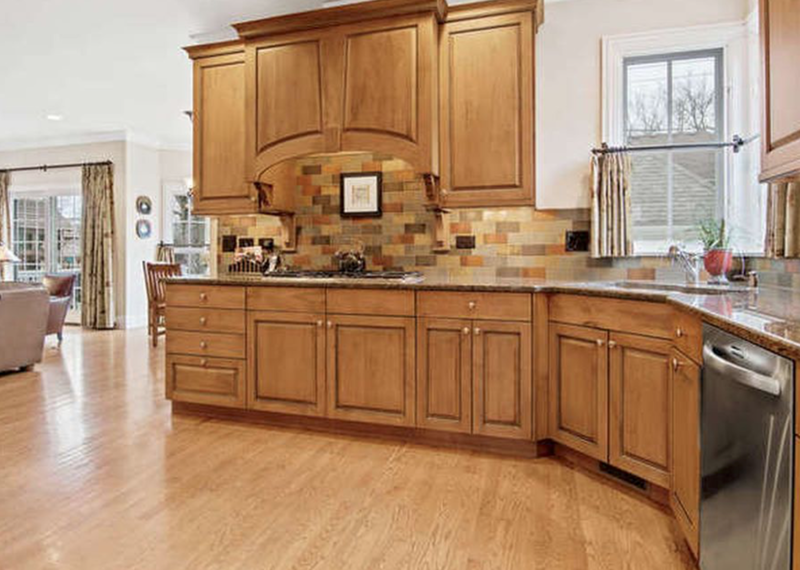 Swapping older stone countertops for new marble or quartz countertops are an excellent way to update your kitchen. For a few hundred dollars, this one small change can completely transform your kitchen - making even the most ordinary kitchen space into something you’ll want to show off. 4.Swap Out Your Hardware: Sometimes all it takes to change the look of your kitchen is a hardware update. Swap out outdated drawer pulls and cabinet knobs to give your kitchen a fresher look. Not quite enough? Consider painting your cabinets to really change the feel of your space. 5.Accessorize With Small Appliances: Toasters, stand mixers, and many other small kitchen appliances aren’t just functional must-haves. Many of these gadgets come in bright colors or with fun designs. Swapping out your old, dull pieces for newer, more fun gadgets can be a great way to show off your personality and sense of style. 6.Update your fabrics: This can be one of the best ways to change the feel of your kitchen. Hanging new window treatments, a rug in front of the sink, and swapping out your tablecloth or placemats can really change the look of your kitchen. The best part? It’s easy to rotate through various looks as often as you like! For many families, the kitchen is the heart of the home. If it’s out of sync with your style, the whole house can feel off. Luckily, changing the feel of your kitchen doesn’t have to be difficult. With just a few small changes, you can update your space and create a kitchen that you’ll love to cook in.